Found throughout Botswana, from the wetlands to the semi desert. Prevelant in the Central Kalahari and Makgadikgadi Pans. The world's largest living bird occurs throughout Botswana, from the wetlands of the Okavango to the arid reaches of the Central Kalahari. Many people visiting the wilderness have been confused by the loud booming call of the ostrich, which resembles the roar of a lion. The male ostriches have elaborate courtship displays. The bushman people believe that the ostrich cannot fly because god gave them the secret of fire and told ostrich to guard it at all costs, so the ostrich put the secret under his wing and vowed never to open them. Man however managed to trick ostrich and steal the secret but ostrich to this day keeps his promise to protect the secret from others and does not fly. 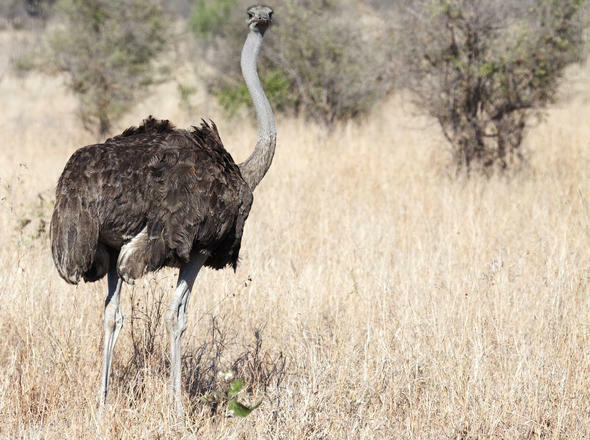 The long-held belief that ostriches stick their heads in the sand is a myth perpetuated by their feeding habits where they feed bent over with their heads close to the ground searching for seeds. From a distance it may look like they have their heads in the sand.